Treasury Secretary Jack Lew on Thursday morning nailed two huge problems with using the debt ceiling as leverage to negotiate spending cuts. This is why some GOP lawmakers say they oppose a clean increase in the borrowing authority. It’s an opportunity to help the economy by reducing the long-term trajectory of the national debt, even if it brings the government perilously close to defaulting on payments for the first time in 224 years. But the threat isn’t just the potential market meltdown that President Obama and several Wall Street executives have warned about. The plan could backfire in a way that causes the deficit to soar. In a Senate Finance Committee hearing, Lew explained the two major problems that would be created by treating the debt limit as a political football. Egged on by Sen. Ron Wyden (D-OR), Lew noted that interest rates would rise if the U.S. government is deemed to be less creditworthy because of a default. In fact, as the showdown has intensified over the past week, rates have tripled on debt maturing at the end of this month, Lew said. Higher interest rates translate into higher borrowing costs. This introduces a new expense into the federal budget, which could cause the deficit to explode. 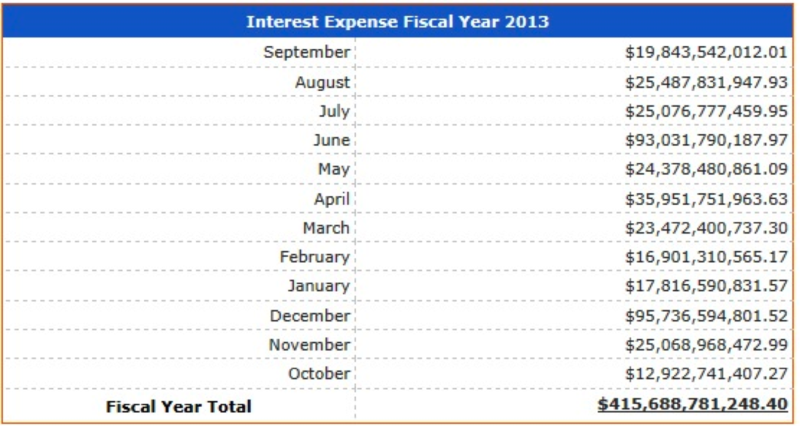 This past fiscal year, the U.S. paid $416 billion in interest charges on the debt. Wyden jumped at the chance to add that this would “in effect transfer American wealth from our taxpayers” to foreign creditors. Lew, seeing an opportunity to pile on, talked about the potential impacts elsewhere. Of course, the administration could defuse this entire scenario by agreeing to negotiate on the debt ceiling. But Obama has warned this would mean the full faith and credit of the government would become a bargaining chip used so frequently that a shutdown becomes inevitable. Utah Sen. Orrin Hatch, the ranking Republican on the committee, stuck to the argument that his party’s strategy on the debt ceiling has been standard operating procedure. “In fact, of the 53 debt limit increases passed since 1978 – under both Republican and Democratic presidents – only 26 were ‘clean,’” Hatch said. But the debt ceiling is substantially different than the current government shutdown that began on Oct. 1. The Treasury is slated to have $30 billion in cash on hand by Oct. 17. It also has to roll over $120 billion in debt on that day and another $93 billion on Oct. 23, two moves that would be sensitive to interest rates. The government would also need to make $12 billion in Social Security payments on Oct. 23. Its obligatory payments on Nov. 1 would total $55 billion. Without a debt ceiling increase, any one of these days could cause a market panic and potentially trigger a default.